• I Swear To God, I Thought She Was 18. If this game were a movie, Jack Nicholson would be lying there with a bullet in him, smiling, like in The Departed. The Dallas Mavericks won their 17th straight, dealing the Lakers their worst home loss in Los Angeles, 108-72, as Josh Howard scored 24 points and Dirk Nowitzki had 19. It's the longest win streak in Dallas' history. 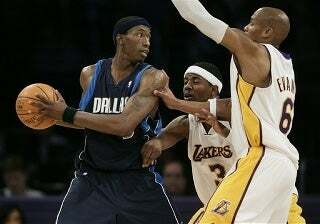 LA's Smush Parker was ejected early in the second quarter after his second technical foul. Kobe Bryant had 25 points. • The Air Up There. In addition to being able to pick apples without a ladder, Yao Ming can block shots — four of them on Sunday — as Houston topped Orlando 103-92. In his fourth game back from a leg injury, the Mingmeister had 37 points. Houston is 3-1 with Yao back in the lineup. • You Can Call Me Al. If there had ever been a sure thing in life, it had to be Denver losing at Sacramento. The Nuggets haven't won there in 20 straight games, until Sunday, when Allen Iverson's 24 points and seven assists led a 113-101 win. Plus, there was this fun sequence: Iverson received three fouls and a technical in the first quarter. He got the technical for running toward the bench after one of the fouls. "How could I get a technical for something like that?'' asked Iverson. We're looking into it. Carmelo Anthony had 29 points. Ron Artest returned from suspension, or whatever you call it, to score 17 points for the Kings. • Piston Hurricane. Richard Hamilton had 23 points to lead the Pistons over the Clippers 98-80. Detroit beat LA for the ninth straight time despite the Pistons missing Rasheed Wallace, who was suspended for one game after receiving his 16th technical foul on Friday; an automatic no-no in the NBA.